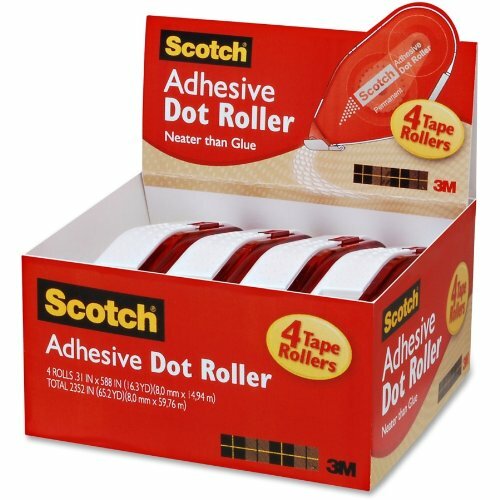 Scotch Adhesive Dot Roller Value Pack. 4 applicators in a convenient tray-great for the workplace and for high-volume users at home. Adhesive Dot Roller is the fast, no-mess way to apply double-sided adhesive, and it's refillable. The adhesive rolls on easily, and unlike glue or glue sticks, there is no drying time and no wrinkling. Roller applies a fine dot pattern of double sided adhesive for a clean cut and secure hold. Neat, professional results. 4 applicators in a convenient value pack. Great for high-volume users at the workplace and at home.